Starry Starry Night Laser Projectors add fireworks lighting effects to any event. With their adjustable speed control and music sensitivity, these laser beams transform and space. In warm dry weather, they are often used outdoors projecting beams for 100 feet or more. Thanks to Douglas Hooper for capturing this series of photos. Contact him for professional special events photography including weddings. Even with bright lighting in the room, these powerful projectors add this sparkling lighting effect for as little as $59. Their quickly moving beams keep the party hopping! When the lights go down the effects are magnified into magical proportions! Watch your friends become decorated with the lighting effects for their transformative powers. Any costume becomes must more impressive with lighting effects to contribute. 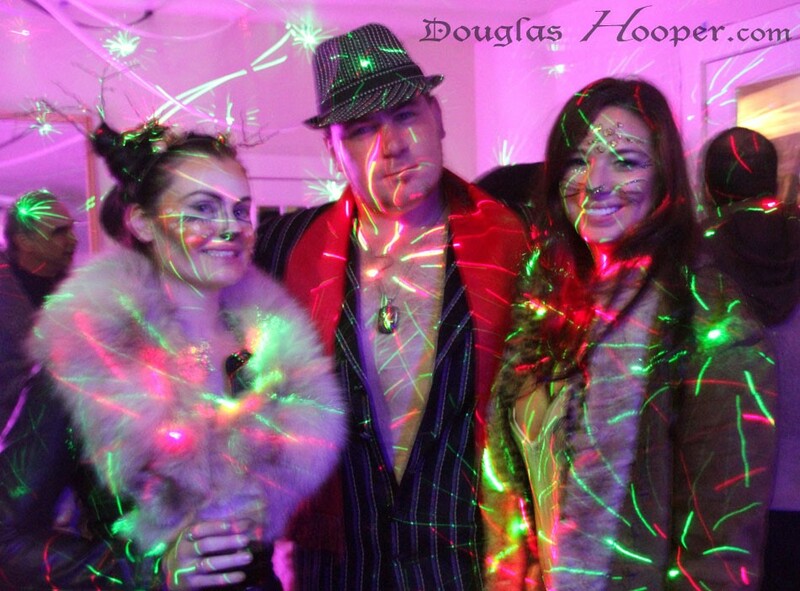 Contact Douglas Hooper for professional photography in Nevada County. Visit Douglas' website here to see more of his photographic work. Liven up your next party with a few simple low cost lighting effects to take it to another level! Newer Holographic lighting and fog. Holographic lighting and fog.